The Yaskawa P1000 AC Drive is a simplistic yet reliable drive for variable torque loads through 1000 horsepower. 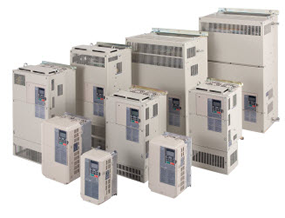 If you need a cost-effective AC motor control solution, P1000 drives offer specific application features, energy savings, and network connectivity, particularly for industrial fans and pumps. The P1000 Configured package features a P1000 AC drive in a NEMA 1 (UL Type 1) or NEMA 12 (UL Type 12) enclosure, with space for factory-mounted and wired options, such as filters, fuses, reactors, circuit breakers, network communications and I/O cards, etc. Call Carotron at 1-888-286-8614 for Yaskawa P1000 pricing and more!